At the Internet Retailer Conference and Exhibition (IRCE) in Chicago, MarketingSherpa, sister company to MarketingExperiments, has been hosting the official Media Center of the more than 10,000-attendee event. Website Magazine, have joined MarketingSherpa’s Daniel Burstein and Allison Banko in the Media Center to discuss the state of the e-commerce landscape in 2014. We have heard insights on global e-commerce trends, mobile and responsive design, B2B e-commerce and much more this week, all captured and posted online at MarketingSherpa.com/IRCE. In today’s post, I wanted to share with you a few of the top takeaways from the IRCE Media Center for tactics and strategies you can use to improve your own marketing efforts. Jimmy Wales, CEO and Founder, Wikipedia, stopped by the Media Center and shared how e-commerce sites can empower an online community to evangelize a brand. One thing Jimmy stressed about community building is that it’s not something marketers can force upon their customers. It’s also not free labor. Instead, marketers looking to cultivate user-generated content need to do it in a way that makes sense, and provide people with the tools they need. “Don’t think about [user-generated content] as the work that you want customers to do, but rather, what they want to do and how you can empower people to do it,” Jimmy said. Carolyn Kmet, Chief Marketing Officer, All Inclusive Marketing, explained how reaching out for content from outside bloggers can add a level of credibility regular in-house writers cannot provide. With bloggers, they have their own audiences and can create unbiased content for your brand. To begin, it only requires some research into bloggers and their content focuses, finding the ones that meet your needs, and reaching out to them personally, Carolyn said. One thing Carolyn also mentioned is that building relationships with bloggers is not a one-way street. You have to offer useful incentives that make putting your brand in front of their audience a worthwhile endeavor. An incentive Carolyn tries to provide bloggers with is access to thought leaders or suppliers for interviews they would not have been able to gain as easy otherwise. “Their editorial oversight is entirely theirs. It would be inappropriate for us to influence what they write, and we want them to continue to have that credibility, because that credibility is what garners them their audience. If they have credibility and their audience believes them, then whatever they say about us is true,” Carolyn explained. Michael Layne, Director of Internet Marketing, and Jen Rademacher, Chief Information Officer, both of Fathead, joined Daniel to talk about Fathead’s responsive design efforts. The increase in utilizing responsive design as a solution for the age of multi-device customers didn’t happen overnight. And it won’t happen overnight for your company either. By frequently meeting and communicating their needs with Fathead’s IT team, they were able to provide a user experience that was no longer limited to the device a customer was using. Ryan West, CEO, WestMusic, sells instruments to elementary schools. But just because his e-commerce site is focused on B2B doesn’t mean it should be treated any differently. Ryan, along with Sean Cook, CEO, ShopVisible, revealed the importance of maintaining an omnichannel presence in B2B e-commerce marketing. “Marketers need to have a realization that companies are filled with people. You might be selling to an enterprise, but they are filled with people, too,” Sean said. Ryan, whose business also includes retail locations, discussed how the lines between online and offline presences are becoming blurred as consumers are using more devices than ever to research and purchase. The customer journey, especially for WestMusic, has evolved into multiple touch points including desktop, mobile and in-store purchases. Pete Prestipino, Editor-in-Chief, Website Magazine, paid a visit to the Media Center to reveal an answer to a question many marketers ask: How often should you send emails? According to Pete, frequency all depends on customer behavior and what makes sense to your product and industry. “Create a rich profile of the user. Find out where they come from, where they spend their online consumptive behavior,” Pete said. Understanding the customer is key, because consumers are becoming much more sophisticated, and their buying decisions are becoming much more complex, according to Pete. Of course, it doesn’t end here. 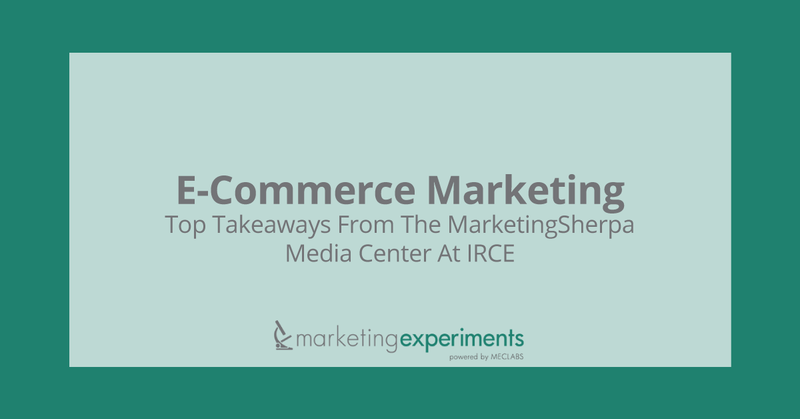 Check out MarketingSherpa.com/IRCE for the latest interviews, and download the MarketingSherpa E-commerce Benchmark Study, made possible by a research grant from Magento, for an even deeper dive into the latest e-commerce discoveries. Very true, using bloggers can add quite a bit of true credibility to your brand! Why not use the brand evangelists? They do your brand a lot of good power and WOM. Very awesome.